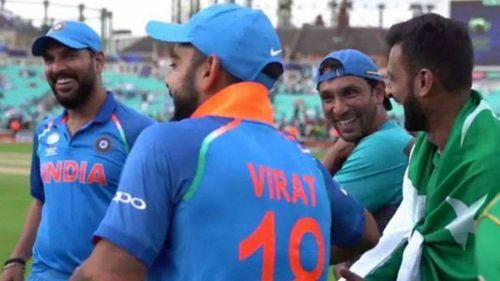 Indian and Pakistani senior players and staff share a laugh after the Champions Trophy final. The upcoming 50-over Cricket World Cup in England would be the best platform for cricketers to prove their mettle. A good performance in the tournament can do wonders to the career of any player - especially of the youngsters. But a special group of players who are expected to perform in this World Cup is the senior bunch. If you have a close look at the recent editions of the World Cups, senior players with over ten years of international experience at the time of the tournament, have had a huge role in their team winning the World Cup. Whether it was Mitchell Johnson and Shane Watson in 2015; Yuvraj Singh and Zaheer Khan in 2011; or Glenn McGrath, Matthew Hayden, Adam Gilchrist, Ricky Ponting and Brad Hogg in 2007; the teams with experience under their belt have flourished. However, some of the most highly rated players of this decade from various teams had started to fade around a couple of years ago. While some of them retired or got lost in the oblivion, some of them got back in form at just the right time - thanks to some support from their selectors as well. What is most noteworthy is how these stalwarts came back to the mainstream on merit to prove their importance to the side. While some of them suffered a big dip in form, many of them almost fell prey to career-threatening injuries. Let us have a look at some senior pros who looked out of sorts till around a year ago, but are now at the helm of things for cricket's biggest tournament. Let us also get to know about their dip in form and how they reversed their fortunes in this period. When Lasith Malinga reached his 300th ODI wicket in August 2017, it seemed as if it would be the last milestone in an illustrious career. Historically, one of Sri Lanka's best one day bowlers, Malinga was also the captain of the Sri Lankan team that won the ICC World T20 in 2016. Average outings in the 2017 Champions Trophy and the home series against India and Zimbabwe did not offer any help to Malinga, who was then making his ODI comeback after almost two years. He was dropped for the following ODI series against Pakistan in UAE. For over a year, a young and struggling Sri Lankan side tried many bowling combinations - but none failed to make a permanent mark. Malinga was finally recalled for the all-important Asia Cup in September 2018. The senior pro impressed in his very first match, finishing with figures of 4 for 23 from 10 overs against tournament runners up Bangladesh. Although Sri Lanka lost the match, Malinga was particularly impressive in a relatively high scoring match from the tournament perspective. In the following home series against number-one ranked ODI team England, Malinga registered his eighth five-wicket haul in ODI's in the second match of the series. He also finished as one of the leading wicket-takers during the subsequent ODI series in New Zealand. Though the series was disappointing from his team's point of view, he also managed to get a few runs with the bat down the order.